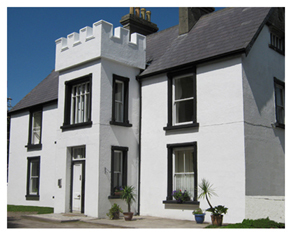 is located on beautiful Achill Island in County Mayo. Achill is connected to the mainland by a bridge, so access is easy. We are a 50 minute drive from the town of Westport, via Newport and Mulranny. The camp residence is at The Valley House Hostel, in The Valley, on the north east side of the island. This historic house has a fascinating history and has entertained tourists, youth groups, school groups and international vistors for many decades. 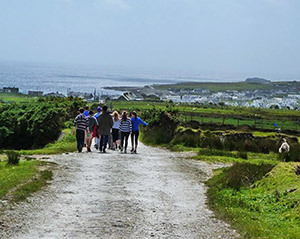 The Gallagher family have been in business here since 1947 and have over 35 years experience accommodating youth and student groups from both Ireland and abroad. We understand the concerns you might have when sending your children away from home - please feel free to ring or email if you wish to discuss any aspect of the course or the accommodation. You can contact Alice Gallagher at Language Camp West by email at info@languagecampwest.ie or by phone on 086-4578672 or 086-1728866. What do Parents & Students say about Language Camp West? Students are often very concerned that they will be on their own and that other members of the group will be paired off or in groups of friends. 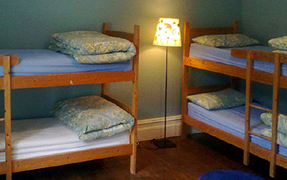 While friends do sometimes come to camp together, it is much more common for individual students to book the course. Many of the other students will be in the same boat in that they do not know anyone else going to camp. Our Animator team, teachers and staff make every effort to ensure everyone settles in well. There are ice-breaking games, an evening meal and an orientation on the first night of arrival. By the time classes and activities start the next morning, students will be very busy and these worries will fade away. Public liability insurance is in place and all activities are fully insured by our activity providers. Theft, loss or damage to personal items are not covered by any insurance policy. Students should leave valuable items at home and should not bring large amounts of money or expensive items with them to camp. Tablets, laptops, iPods, iPads, game devices etc. are not allowed and will be held by management until the student's departure. Language Camp West is not responsible for loss or damage to students' belongings. It is not recommended that students bring large amounts of money to camp. There are no shopping malls on Achill Island but some pocket money to buy souvenirs, treats etc. will be necessary. There is a full GP/Medical Clinic service on Achill Island. The Westdoc out-of-hours GP service is also available, providing full coverage in the event of any illness. Any medical expenses incurred are the responsibility of the students' parent/guardian. If a student needs any help with medication or has any dietary or allergy concerns, please let us know when booking. The safety and security of students is our number one priority at Language Camp West. The ratio of students to Animators is maximum 10:1. In addition, the School Managers, teachers and accommodation staff are trained to respond to and resolve any problems that may arise. Staff are available to parents and willing to assist in any way they can to help a student settle in to camp. An orientation is given to the students at the beginning of each course. Language Camp West has a Child Protection Policy in place and this can be viewed upon request. All staff who reside in the camp and have contact with the students are Garda Vetted. During sport and water-based activities, our activity partners place each student under the supervision of qualified instructors. The ratio of students to instructors is 8:1. In addition, our Animator team takes part in all activities to ensure that the safety and security of each student is fully supervised. Our main activity provider is Achill OEC. This centre has provided outdoor education programmes since 1971 under the auspices of County Mayo V.E.C. Programmes are delivered by qualified and experienced instructors to the highest safety standards. Students must communicate in the course language at all times. Failing to make a good effort will mean a poor result for everybody. Help and encouragement as well as written visual aids will be given – students will be expected to attempt a good percentage of the sentence in the course language and to gradually increase that effort as their confidence grows. Please note that Adventure Sports instruction on some days is given partially in English for safety reasons, but using the course language is mandatory between students and staff at all times. Students who do not make an effort to speak the course language will receive a formal warning; if the behaviour continues and no improvement or effort is made, the student may be asked to leave the course. In this case, it is the responsibility of the parent to pick up the student from the camp in Achill. No refund will be given on course fees.Please click here to read the full list of School Rules. For the benefit of all students and staff, a respectful attitude and courtesy towards others is required at all times on the course. Please click here to read the full list of School Rules. Mobile phones will be held by the student's camp counsellor and student's will be allowed the use of their phone for half an hour each night before bed. Please click here to read the full list of School Rules. Students can choose bus travel from Dublin via Athlone for an additional fee. Our buses are private coaches or mini-buses and are fully supervised by our Animator team. Bus tickets must be pre-booked, and places cannot be guaranteed last minute. Please note students must be dropped off/picked up in either Dublin, Athlone or Castlebar, the bus cannot make any other stops. One-way and Return tickets are available. Bus details such as drop off locations, times and prices will be announced by Easter 2019 and tickets can be booked at that time. The bus is optional and students may be dropped off and picked up at the school. Take the N84 to Headford, on to Ballinrobe and to Castlebar. 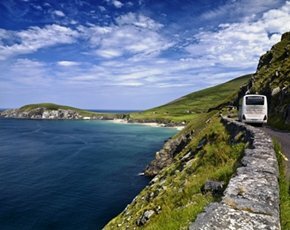 Take the Newport road, go through Mulranny village and the R319 takes you to Achill. Head for Sligo, then take the N17 to Tubbercurry. At Charlestown, take the N5 to Castlebar. Take the Newport road, on to Mulranny and the R319 to Achill. Go straight through Achill Sound and drive about 5km out the road to Cashel. (You will pass Ted's pub and the Topaz petrol station on your right). Keep on this road and drive on to Bunnacurry. TURN RIGHT at the signpost for The Valley House (road number L1406). Stay on this road for 3km, go straight through the crossroads (The Valley House is signposted here also). After 200m you will turn right into The Valley House entrance and you will find us at the end of a long avenue.